The 1954 Tour de France was the 41st edition of the Tour de France, taking place from 8 July to 1 August 1954. It consisted of 23 stages over 4,656 km (2,893 mi). The race was won by Louison Bobet, the second of his three consecutive wins. For a more comprehensive list, see List of teams and cyclists in the 1954 Tour de France. As was the custom since the 1930 Tour de France, the 1954 Tour de France was contested by national and regional teams. Seven national teams were sent, with 10 cyclists each from France, the Netherlands, Belgium, Spain, Switzerland and Luxembourg/Austria (the latter a combined team). France additionally sent five regional teams from 10 cyclists each, divided into Center-North East France, West France, South East France, Ile de France and South West France. The combined team Luxembourg/Austria consisted of six Luxembourgian cyclists, three Austrian cyclists and one from Liechtenstein. In total, 110 cyclists started the race. Notable absents were the Italian cyclists. In Italy, new sponsors had entered the market, named "extra-sportives" because they did not sell a product directly related to the sport. During the 1954 Giro d'Italia, this caused a strike, the Bernina strike. After this, the Italian federation decided not to send a team to the 1954 Tour de France. The 1954 Tour de France was the first time that the Tour had started outside France, as it started in Amsterdam. Also new was the team time trial. Although around 1930 the Tour had seen stages in which the teams started separately, in 1954 the team time trial format was reintroduced in a way that only the team time counted. Also the split stages were reintroduced. Stage 4 was divided into two parts: the team time trial of 10.4 km (part A), and a regular stage of 131 km (part B), both run on the same day. Similarly, stage 21 was divided into a regular stage of 134 km (part A) and an individual time trial of 72 km (part B), also both run on the same day. There were two rest days, in Bordeaux and Lyon. In the first stage, Wout Wagtmans won the sprint, and took the yellow jersey. He would remain the leader until the team time trial in stage 4, when the French team won back enough time on the Dutch team for Bobet to take over the lead. In that time trial, over 10.4 km, the winning team was decided by adding the times of the three best cyclists per team. For the general classification, every cyclist got added his individual time. In the second part of the fourth stage, former winner Jean Robic hit a photographer during the sprint, fell down and had to give up. In the eighth stage, Wagtmans had joined a breakaway, which won enough time on Bobet for Wagtmans to take back the yellow jersey. Wagtmans fell down in the eleventh stage, and although he managed to keep his lead until the start of the twelfth stage, he continued without morale. In the twelfth stage in the Pyrénées, three important riders attacked: Bauvin, Bahamontes and Malléjac. They stayed ahead, and Bauvin jumped to the first position in the general classification. Bobet was not far behind these three, and moved into the second place. In that twelfth stage, Hugo Koblet had fallen down, and lost 27 minutes, and his chances to win the Tour de France a second time. In the next stage, Koblet gave up. In the fourteenth stage, the Swiss cyclists were fighting back. They were riding as fast as they could, and the leading group was getting smaller. Bauvin also could not keep up with that group, partly because he had a flat tire, and finished 8 minutes behind, losing the leading position. Bobet however could keep up with the Swiss pace, and took over the yellow jersey as leader of the general classification. In the sixteenth stage, Bauvin lost another 20 minutes, and dropped to sixth place. The Swiss cyclists had attacked Bobet where they could, but were unable to gain time on him. They had moved into second and third place of the general classification. In the eighteenth stage, Bobet dominated, and dropped all of the other contenders. He won by a margin of one minute and 49 seconds, and his margin in the general classification was 12 minutes 49 seconds, which would normally be large enough for the victory. Bobet also won the individual time trial, and thereby increased his margin even more. The Swiss cyclists could not attack Bobet anymore in the last stages, so Bobet won his second Tour de France. The Swiss team had performed well though, capturing the second and third place in the general classification, winning the team classification and having Kübler win the points classification. Ferdinand Kübler won the points classification in the 1954 Tour de France. The time that each cyclist required to finish each stage was recorded, and these times were added together for the general classification. If a cyclist had received a time bonus, it was subtracted from this total; all time penalties were added to this total. The cyclist with the least accumulated time was the race leader, identified by the yellow jersey. Of the 110 cyclists that started the 1954 Tour de France, 69 finished the race. The points classification was calculated in the same way as in 1953, following the calculation method from the Tours de France from 1905 to 1912. Points were given according to the ranking of the stage: the winner received one points, the next cyclist two points, and so on. These points were added, and the cyclist with the least points was the leader of the points classification. In 1954, this was won by Ferdinand Kübler. Points for the mountains classification were earned by reaching the mountain tops first. The system was almost the same as in 1953: there were two types of mountain tops: the hardest ones, in category 1, gave 10 points to the first cyclist, the easier ones, in category 2, gave 6 points to the first cyclist, and the easiest ones, in category 3, gave 3 points. Federico Bahamontes won this classification. The team classification was calculated as the sum of the daily team classifications, and the daily team classification was calculated by adding the times in the stage result of the best three cyclists per team. It was won by the Swiss team. In every stage, a jury gave points for the most combative cyclist. These votes were added in the combativity classification. At the end of the Tour de France, Lucien Lazaridès and François Mahé were leading this classification with 20 votes each. Lucien Lazaridès is regarded as the winner of this classification. Louison Bobet (FRA) France 140h 06' 05"
Ferdinand Kübler (SUI) Switzerland + 15' 49"
Fritz Schär (SUI) Switzerland + 21' 46"
Jean Dotto (FRA) South East + 28' 21"
Jean Malléjac (FRA) West + 31' 38"
Stan Ockers (BEL) Belgium + 36' 02"
Louis Bergaud (FRA) South West + 37' 55"
Vincent Vitetta (FRA) South East + 41' 14"
Jean Brankart (BEL) Belgium + 42' 08"
Gilbert Bauvin (FRA) Center-North East + 42' 21"
Nello Lauredi (FRA) France + 42' 42"
Carlo Clerici (SUI) Switzerland + 56' 36"
Apo Lazaridès (FRA) South East + 1h 04' 03"
Jan Nolten (NED) Netherlands + 1h 04' 15"
François Mahé (FRA) West + 1h 09' 03"
Wim van Est (NED) Netherlands + 1h 09' 13"
Gerrit Voorting (NED) Netherlands + 1h 10' 20"
Bernardo Ruiz (ESP) Spain + 1h 11' 28"
Antonin Rolland (FRA) France + 1h 12' 20"
Hein van Breenen (NED) Netherlands + 1h 19' 10"
Marcel De Mulder (BEL) Belgium + 1h 21' 08"
Richard Van Genechten (BEL) Belgium + 1h 24' 58"
Lucien Teisseire (FRA) France + 1h 28' 52"
Lucien Lazaridès (FRA) South East + 1h 31' 53"
Federico Bahamontes (ESP) Spain + 1h 37' 42"
Adolphe Deledda (FRA) France + 1h 39' 46"
Jean Forestier (FRA) France + 1h 43' 48"
Maurice Quentin (FRA) Île-de-France + 1h 45' 24"
Alex Close (BEL) Belgium + 1h 56' 00"
Willy Kemp (LUX) Luxembourg-Austria + 2h 03' 21"
Francesco Alomar (ESP) Spain + 2h 15' 02"
Dominique Forlini (FRA) Île-de-France + 2h 18' 36"
Jean Le Guilly (FRA) Île-de-France + 2h 19' 48"
René De Smet (BEL) Belgium + 2h 28' 39"
Raymond Hoorelbeke (FRA) Île-de-France + 2h 29' 44"
Alfred De Bruyne (BEL) Belgium + 2h 32' 01"
Andrés Trobat (ESP) Spain + 2h 45' 10"
Raoul Rémy (FRA) France + 2h 47' 04"
Georges Meunier (FRA) Center-North East + 2h 49' 53"
Jacques Vivier (FRA) South West + 2h 50' 21"
Robert Varnajo (FRA) West + 2h 55' 51"
Joseph Mirando (FRA) South East + 2h 56' 18"
Emilio Rodríguez (ESP) Spain + 2h 57' 18"
José Pérez (ESP) Spain + 2h 59' 45"
Manuel Rodríguez (ESP) Spain + 3h 03' 25"
Jean-Marie Cieleska (FRA) Center-North East + 3h 06' 27"
Henk Faanhof (NED) Netherlands + 3h 09' 48"
Jean Carle (FRA) Île-de-France + 3h 17' 18"
André Darrigade (FRA) France + 3h 17' 56"
Remo Pianezzi (SUI) Switzerland + 3h 19' 56"
Stanislas Bober (FRA) Île-de-France + 3h 21' 02"
René Privat (FRA) South West + 3h 22' 31"
Marcel Guitard (FRA) South West + 3h 23' 58"
Salvador Botella (ESP) Spain + 3h 27' 00"
Francesco Masip (ESP) Spain + 3h 28' 59"
Emilio Croci-Torti (SUI) Switzerland + 3h 33' 20"
Eugène Telotte (FRA) Center-North East + 3h 37' 41"
Alfred Tonello (FRA) Île-de-France + 3h 38' 18"
Pierre Molinéris (FRA) France + 4h 09' 27"
Georges Gilles (FRA) West + 4h 15' 05"
Francis Siguenza (FRA) South East + 4h 15' 09"
Marcel Dussault (FRA) South West + 4h 17' 45"
Albert Bouvet (FRA) West + 4h 20' 06"
Marcel Hendrickx (BEL) Belgium + 4h 36' 29"
Émile Guérinel (FRA) West + 4h 40' 50"
Jean Bellay (FRA) Center-North East + 4h 44' 56"
Philippe Agut (FRA) South West + 4h 47' 21"
Kurt Schneider (AUT) Luxembourg-Austria + 5h 50' 12"
Marcel Dierkens (LUX) Luxembourg-Austria + 6h 07' 29"
Netherlands + 1h 09' 00"
South East + 1h 13' 37"
Spain + 2h 26' 08"
West + 2h 42' 58"
Center-North East + 3h 50' 16"
South West + 4h 08' 31"
Île-de-France + 4h 27' 52"
Luxembourg-Austria + 10h 20' 27"
After he won the Tour de France, Bobet would later win the 1954 UCI Road World Championships. The next year he would win the 1955 Tour de France, thereby becoming the first cyclist to win three Tours in a row. ^ a b c d e f "41ème Tour de France 1954" (in French). Mémoire du cyclisme. Archived from the original on 1 March 2012. Retrieved 26 September 2016. ^ a b "Tour-Giro-Vuelta". www.tour-giro-vuelta.net. Retrieved 10 December 2009. ^ a b c d McGann, Bill; McGann, Carol (2006). The story of the Tour de France, volume 1: 1903-1964. Dog Ear Publishing. pp. 198–206. ISBN 1-59858-180-5. ^ a b c d e f Amels, Wim (1984). 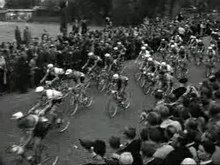 De geschiedenis van de Tour de France 1903–1984 (in Dutch). Sport-Express. pp. 71–72. ISBN 90-70763-05-2. ^ a b c d Augendre 2016, p. 45. ^ Arian Zwegers. "Tour de France GC top ten". CVCC. Archived from the original on 10 June 2009. Retrieved 10 December 2009. ^ "41ème Tour de France 1954 - 4ème étape (a)" (in French). Mémoire du cyclisme. Archived from the original on 2 March 2012. Retrieved 26 September 2016. ^ "Nolten stijgt weer in het klassement" (in Dutch). Leeuwarder Courant. 20 July 1954. Retrieved 10 December 2009. ^ a b c d Barry Boyce (2004). "Bobet Excels Again". Cycling Revealed. Retrieved 10 December 2009. ^ "Nolten rukt op, thans zevende" (in Dutch). Leeuwarder Courant. 21 July 1954. Retrieved 10 December 2009. ^ "De Bruyne wint voor de tweede keer een etappe" (in Dutch). Leeuwarder Courant. 21 July 1954. Retrieved 10 December 2009. ^ "Het Tour panorama 1954" [The Tour panorama 1954]. Gazet van Antwerpen (in Dutch). 3 August 1954. p. 8. Archived from the original on 16 February 2019. ^ van den Akker, Pieter. "Informatie over de Tour de France van 1954" [Information about the Tour de France from 1954]. TourDeFranceStatistieken.nl (in Dutch). Archived from the original on 2 March 2019. Retrieved 2 March 2019. ^ a b c "1954: 41e editie". Tourdefrance.nl. 30 December 2003. Archived from the original on 8 March 2012. Retrieved 10 December 2009. ^ "Bobet toont in de tijdrit zijn grote klasse" (in Dutch). Leeuwarder Courant. 31 July 1954. Retrieved 10 December 2009. ^ a b "Bobet onbetwist winnaar van de Tour de France" (in Dutch). Leeuwarder Courant. 2 August 1954. Retrieved 10 December 2009.